I am proud to be participating in an awesome fund raiser for some friends back home in MO. I have mentioned Art Feeds before in a few posts, they had a birthday, Meg shared an awesome DIY and when I shared recently about how you can help during our two year anniversary as well a great ongoing effort to help the students in Moore, OK. Well Needless to say I think they;re pretty great and wholeheartedly believe what they are doing is super beneficial. Art programs in school to help with creative healing? What can be bad about that? Nothing! 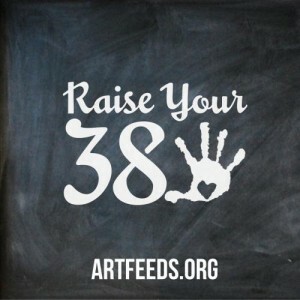 So I signed up to host a fundraising page for their Raise your 38! It’s real simple, You just donate a couple bucks to help them continue to fund their programs so they can offer these for free to all the kids. They have HUGE goals and I would love to see them reached! Just go here to donate on my page and all the money goes to kids!